Start standing up straight. Hold the weights in front of you at waist height by keeping the elbows flexed and to your side. 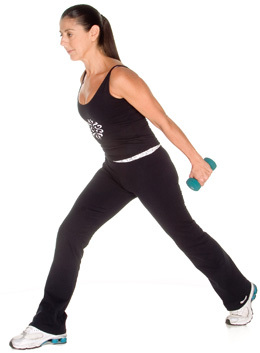 When lunging, bring the weights behind you by extending the elbows and rotating the shoulders back. Leaning your trunk forward will help you lift the weights higher. Do 10-20 repetitions with each leg.